Ahahaha poor guy! He seems to be really into this gemology/jewelry making thing! 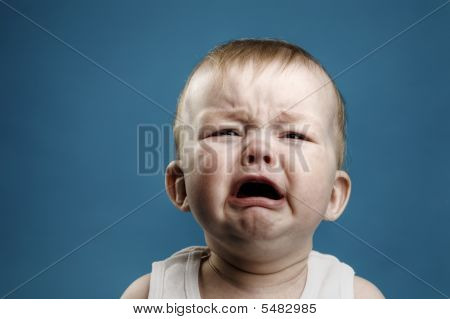 HBS Guy wrote: Ahahaha poor guy! He seems to be really into this gemology/jewelry making thing! Yeah, he's really getting into it. Will have to look at a second-hand bench grinder or something - you can't become proficient at something with one night per weeks practice. 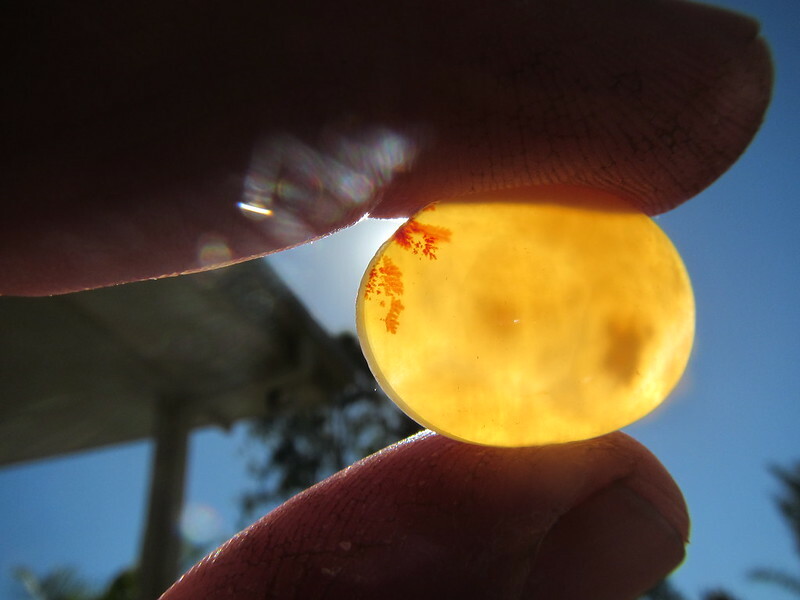 I finished the top of a piece of chalcedony, back still needs to be polished. The polish is correct and the dome shape is correct but the stone is un-usable because it is visibly lopsided. The pitting in the original piece caused the tip of the aluminium marking pencil to wander slightly when marking out. Didn't check carefully enough and got to a stage where I noticed it but thought "bugger going back to the start, this is only my first practice at this, I''ll polish it anyway. Will put it away in a drawer. Yeah, sounds like a nice bit of stone that tigers eye! HBS Guy wrote: Yeah, sounds like a nice bit of stone that tigers eye! Not quite the shape it should be. It's the actually a lot more mirror-shiny than these photos show, the camera shows the surface as looking greasy for some reason. The chips are on the bottom edge, they will go when the bottom surface is back-bevelled and polished. The transparency will be higher too, though the stuff is translucent by nature. The tiger eye. This piece has not been cabbed or polished yet, just shaped. I have wet it to make the "chantoyancy" or cat's eye feature more apparent. It will really stand out when properly finished and polished. The most interesting thing - which you can't see from a still photo - is the way the metallic sheen moves across the surface as the stone is turned in the light. I must get this one right, the material is too nice to stuff up. The good stuff can be difficult to get hold of too. Looking at the photo, I can now see that I need to come in a fraction more on one side. 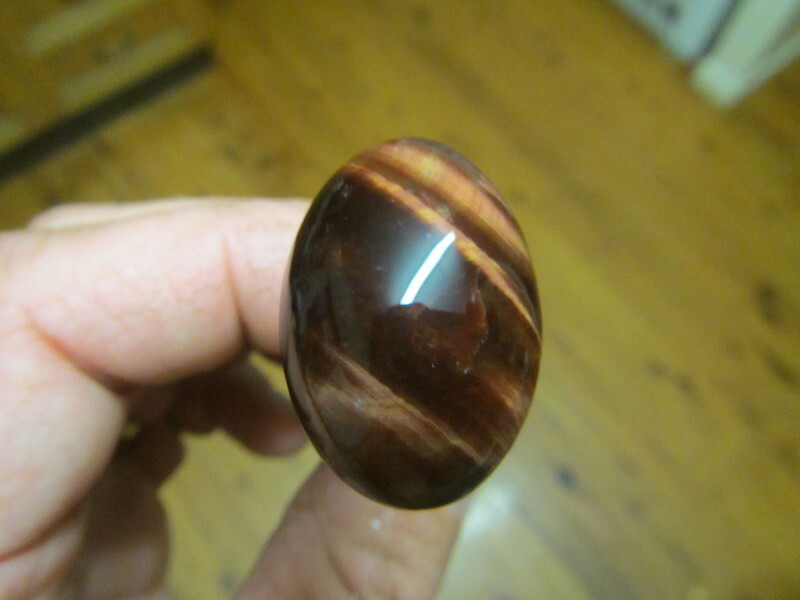 That tiger eye would make a fantastic man’s signet ring or brooch! Yeah, worth doing it slowly and carefully. My idea was for a pendant. Hadn't thought about a ring. Not a bad idea, especially for some of the smaller bits........ Probably enough left to make two more cabs this size plus perhaps four or five little ones. Ring, cufflinks, tieclip lotsa possibilities. The knob on the stick-shift of my car - a real lapidary fanatic's car Well, my first car had a clear plastic knob with a red back spider inside it. Yeah, and on the indicator stick etc. Dad gave me some more stuff from his rock collection to slab and cab. Another piece of tiger eye, some Agate creek agate and a thunderegg. Will run them through the trim saw at the club on Friday. Dad has shitloads of stuff in display cabinets he says I can take. Will take a few bits but not too much - most of the rocks in the display were sliced and polished by my old grandad, I'm not just carting them away to chop them all up. No need, can always dig up some chalcedony or agate to practice. Yeah, got access to plenty of stuff. Some interesting stuff in dad's display cabinets though. 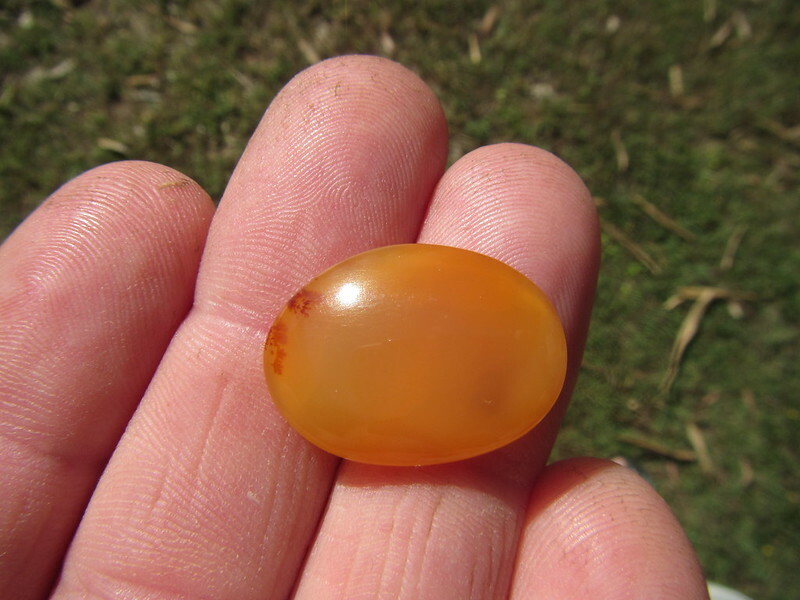 I dropped the (it had been halved and polished on the face) thunderegg on the concrete as I got out of the car this arvo - I had wondered how easily the harder agate inside might seperate from the white, chalky stone exterior. A large piece broke out, leaving the agate behind untouched. Interesting but the agate inside is very uneven, sort of like a giant lopsided burr with bits sticking out from the centre at all angles. Should still slice and cab up ok though. There's no bullseye pattern in it, just an agate centre that has the appearence of smoked glass or smokey quartz. I'm thinking a large teardrop shaped cab for it. I'm just a newbie myself, I only took it up about 6 weeks ago. Fossicking has been in the family a very long time - my grandfather did some cutting (mainly sapphires) and my father had 2 small miners claims on the central Queensland sapphire field when I was little. I've just pegged 2 claims there myself and JM (HBS Guy) is coming up here in about a month's time to go digging with me. Casting was pretty cool, it was all silver today. Only costs about $2 a gram to buy apparently. Gold is rather more exxy. They started last night by placing wax molds in steel cylinders which were then filled with a kind of heat-resistant plaster of Paris stuff and placed in a warmer overnight. By this morning, the plaster was as hard as a rock and the cylinders were inverted over a tray and the oven cranked right up, the wax quickly liquifying and running out through the hole in the block of plaster, leaving behind a perfect hollow imprint. Oven cranked up a bit more to actually burn out and destroy any bits of wax left in there. The cylinders are placed one at a time on their side in a kind of centrifuge. At the end of the centrifuge arm is a crucible made of some super heat-resistant porcelain which is heated with an oxy-acetylene torch until it is starting to glow and the silver lumps droped in. The silver quickly melts into a puddle and the cylinder with the plaster mold butts up against it. They yell "fire in the hole!!" everyone stands back and the centrifuge is released, the spinning action forces the molten silver at high speed out of a little hole in the end of the crucible and down into the mold. When the spinning stops and things have cooled for a few moments, the cylinder containing the now-solid (but still red-hot) silver jewellery is removed and plunged into a container of water. It is then removed and the plaster carefully broken away - and there is the jewellery. Just needs a bit of cleaning and removing small metal bubbles and burrs. 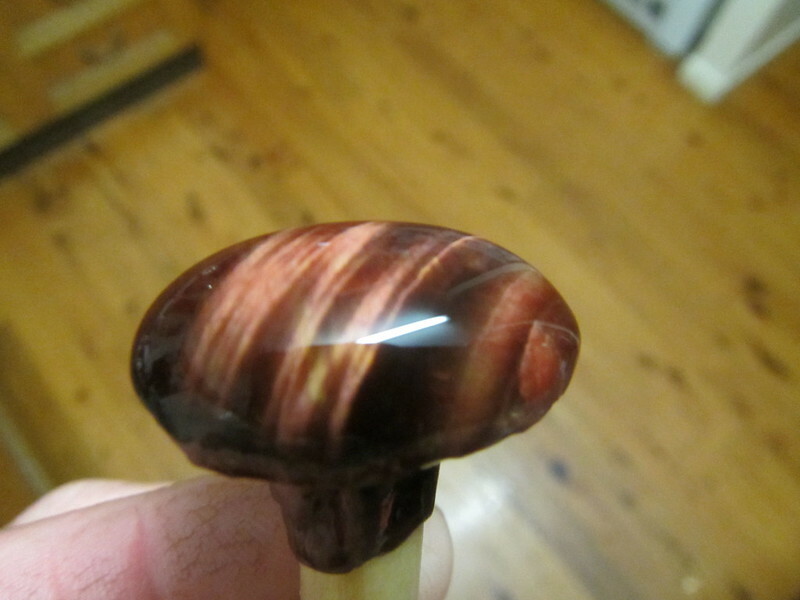 I also progressed a bit further with that tiger eye cab. Still not at the polishing stage yet but have moved from the grinder to the flat disc - next one up will be a pre-polish. I have wet the stone in an attempt to demonstrate "chantoyancy" in still photos - the way the light moves across and through the stone as it is turned. 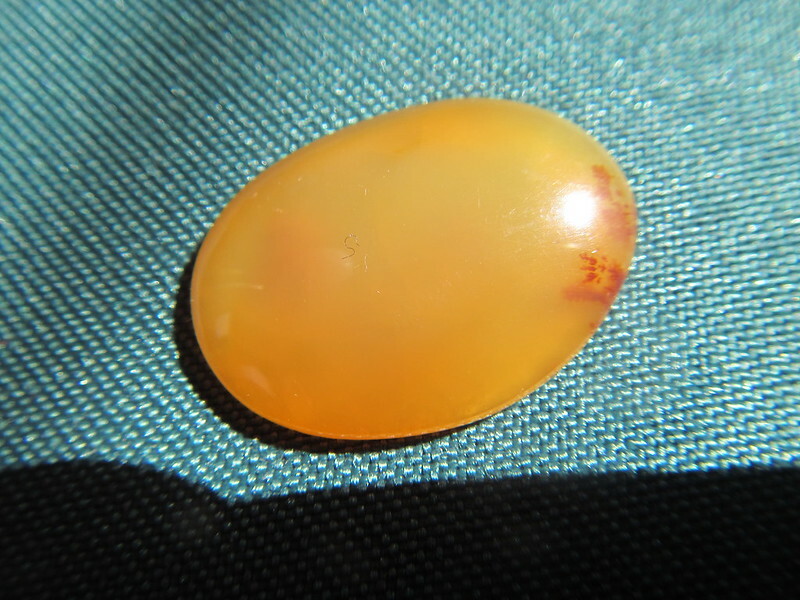 Moonstone and a few other minerals also posses this quality. Turn it another way, and the gold-copper coloured bands move and ripple across the stone, appearing to shift position. Nice! Gives you a whole new color to play with. No cabbing material among it unfortunately Broke the big chunk of rock apart - it's all through it but in extremely thin veins only about a millimetre thick - way too thin to do anything with. Actually, I'm not certain whether it's turquoise or a related mineral - chrysocolla. It's a definate green, though there were a few little dots of deep blue - probably copper sulphate crystalizing. Dad says that in the plastic bag beside the big chunk there is a heap of little bits and one piece about the size of a fingernail may be thick enough to cab. I haven't looked yet. I think if you spent enough time looking over the vein on the island and splitting rocks - the host rock actually splits without any great force needed - you would probably find a few veins and pockets that were thick enough to be useful. But it's on the property of a low-key tourist resort and they might end up chasing you off. Never mind, I've got plenty of stuff to work with. So dissapointed. It was perfectly symmetrical, pretty much good enough to put in a setting. But the crack in the middle just kept getting bigger and bigger until it finally covered the whole face of the stone. After close examination, an experienced person concluded that the cracks were at the surface and were not deep and that I should persist. Well I got the cracks out but in the process the shape was deformed and will take a lot of work to recover - and that in itself might simply expose more cracks and it would no longer fit in a standard setting anyway. Young blokes stone simply disintigrated on the dop. A bad night all round. Ah well, will put it down to experience. Just checked the crack-free but now ugly-shaped stone - a new spiderweb of fine cracks are emerging as it dries. The material is clearly not suitable for cabbing. 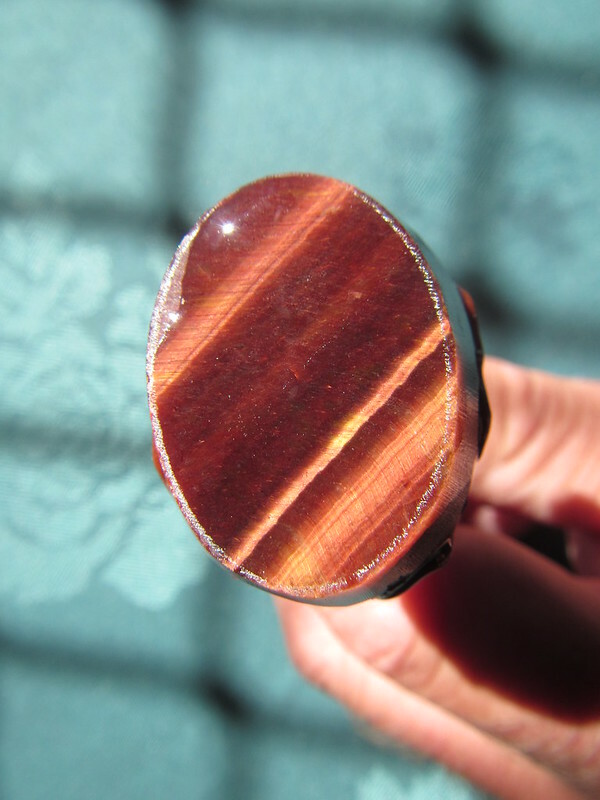 Read an article the other day on people turning regular gold tiger eye into red tiger eye by heat treatment - I'm beginning to wonder if I have such a piece and the heat treatment has made the bonds between the fibres unstable. Stuff still looks great as a polished-face slab in a rock display but cabbing is out of the question. Ok, the asbestos became tiger eye partly through natural heat treatment - but while it was being cooked in the earth, the pressure of millions of tonnes of rock and earth were bearing down on it, probably a bit hard for stone to expand while under so much pressure. Then man discovers he can chnage the colour by heating and bungs the thing in an oven for a day or so. Problem is, the massive pressure of the natural process is absent and the stuff is able to expand and the bonds between the columns of fibres becomes weakened. So back in the rock case goes the remainder - it already has a polished face and despite fine cracks, it looks good as a polished slab in a display. Time to hunt for some more suitable material.